Michigan features one of the lowest average temperatures of any state in the US, but that doesn’t stop plenty of Michiganders from enjoying inground pools during the summer months. As with other cold weather states, the main issue in deciding whether to build an inground pool in Michigan is whether it’s worth it given the relatively short amount of time you can use the pool every year. Compared to other states, warmer temps are short-lived in Michigan. You can typically swim outside between June and September, depending on your cold tolerance. However, an unseasonably warm spring or fall is not that unusual, so you never know when you may get bonus pool time. You’ll most certainly want an electric pool heater to extend the swimming season and get the most use out of your inground swimming pool. It may also pay to invest in a solar pool heater and/or solar cover to keep your heating bills down (these can be combined with an electric pool heater). 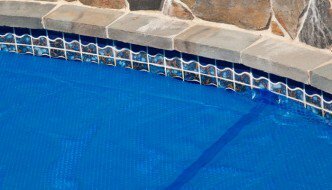 Finally, you’ll definitely need to budget for a sturdy winter pool cover to protect your pool during the harsh conditions of the offseason. Construction wages in Michigan are slightly higher than the national average, so you can expect to pay slightly more for pool installation. However, keep in mind that prices can vary from one place to another, particularly when comparing rural vs. urban areas. As always, check with your municipality to find out what permits are required for private inground pool construction and ownership in Michigan. In most cases, you will need to have your pool blueprint approved and on file with the city in order to receive a permit. Pool safety laws vary by city. However, in Detroit and most other cities in Michigan you will need a safety fence that is at least 4 feet tall. You may also be required to have a self-closing mechanism on the fence gate.